Starting May 22nd, you can buy your own S'moreos: sweet chocolate and marshmallow icing nestled between two crunchy graham flavored cookies. The chocolate creme is notably thicker/more flavorful than the standard Oreo chocolate icing. Come to think of it, it's very similar in taste to the chocolate found in S'mores Pop Tarts. The marshmallow icing — much like the cotton candy icing in the limited edition Cotton Candy Oreo — tastes just like marshmallows. What is this witchcraft??? The treats are perfect for those of us who don't necessarily enjoy camping, but love camp snacks. They are doubtlessly the best limited edition Oreos to date. 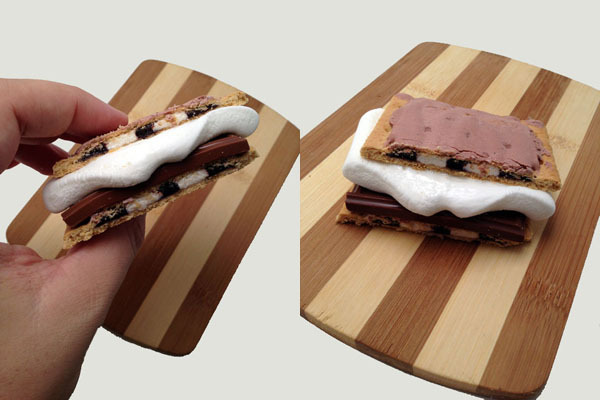 We're not entirely sure how S'moreos came to be, but we have an educated guess: Summer after summer in the visual abyss that is Pinterest, people have been posting their s'mores hacks and recipes for others to try. Homemade s'moreos quickly made their way to the forefront of the trend. The origin isn't what matters, though — it's the taste. The cookies are actually too good and are at the top of our snack lineup. Oreo also told Fusion that they are partnering with ZipCar and on May 21st and 22nd ahead of Memorial Day weekend, you just might find a pack of the new cookies riding shotgun. Score! Be right back, finishing this entire pack.